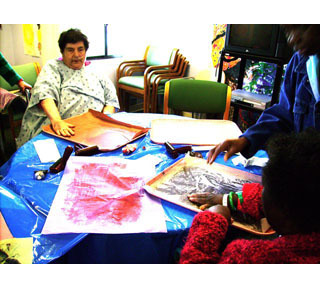 As an Expressive Arts Therapist and a licensed Marriage and Family Therapist, I have been using different forms of expressive art therapy in my job at a hospital in San Francisco for nearly five years now. It is only recently, after my attendance at the Touch Drawing Gathering last summer, that I have had the tools and the training to bring Touch Drawing into the hospital as a form of therapy for those recovering from illness, as well as introduce this process into my private practice. For those who have participated in the Touch Drawing process, it is evident that it is a very personal, therapeutic and artistic process. 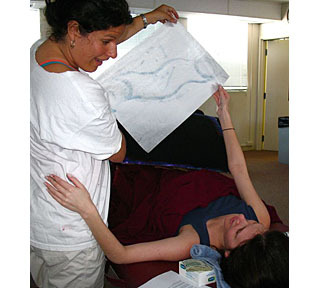 This is what lends Touch Drawing so naturally to be used in a number of therapeutic contexts, like the one I am discussing here: Touch Drawing as a form of pain management. 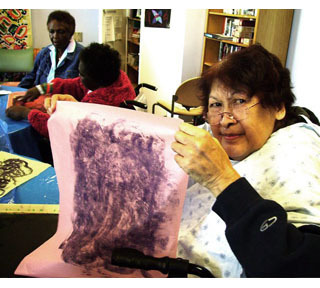 When working with pain and the arts, it is believed that the expulsion of the pain through creative expression can create relief in and of itself. It is no longer stuck, but physically moved out of the body. Energy is now moving where it was once stuck. It can be seen more objectively, as a separate entity, and explored on an even deeper level. 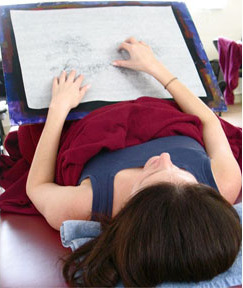 Although there are nearly endless arts modalities that can be used to facilitate the pain management process, the very nature of Touch Drawing, with its rapid pace and very physical use of the body in direct contact with the paper, adds an even deeper level to an already transformative process. The sheer number of drawings created in a single session assists in an even further deepening into an unconscious level, one that can reveal the very nature of the pain we are experiencing and the feelings around it. My experience introducing Touch Drawing to the pain management process has been incredibly eye-opening and amazing. That is the beauty of the process. In repetition around a specific, concentrated issue, Touch Drawing can act as a conduit to the psyche and the body, revealing the truth within us and allowing a way to let this speak. This is particularly helpful when working with pain, and with the healing images that can help alleviate the pain. In a typical group, I begin by guiding participants in a brief meditation, suggesting they bring their awareness into their bodies and notice the areas where they feel discomfort or pain. As they begin to get a feel for these areas, participants are then asked to begin drawing with their eyes closed, feeling into this bodily experience on a visceral level. I remind them that there is no wrong way to do this, and that whatever is true for them is the way to go. They continue this process, going deeper and deeper into whatever bodily experience they are having, moving rapidly from one drawing to the next. If they are physically limited they receive help squeezing paint and rolling it out. I generally have them draw for 15-30 minutes, or more in some settings. Participants are then asked to review their drawings and share in pairs or in the group, depending on the context. The second part of the pain management process begins much the same as the first, with a meditation. 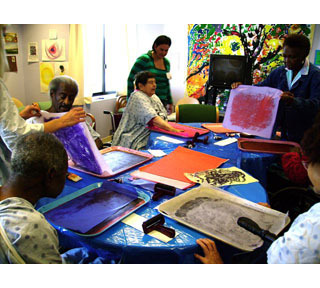 However, this time participants are asked to imagine a quality or image; something from their imaginations that might make this pain feel better or offer them some relief. It doesn’t have to make sense to anyone but themselves. I usually ask them to begin drawing with their eyes closed, and just let the experience of something pleasurable move their hands across the page. This then continues, drawing after drawing, one leading to the next until time comes to a close. 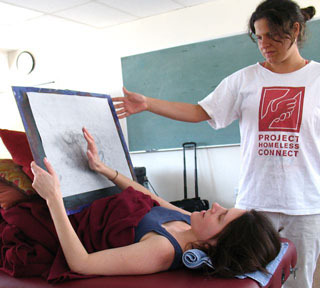 Often participants report a significant lessening of pain. Some prefer not to discuss their drawings at this time to remain in that “pain-relieved” state. Others want to share. Regardless, participants are asked to review their drawings either then or later, to reflect upon the process and what brought them relief. I have done this process in the hospital setting and in other group contexts. 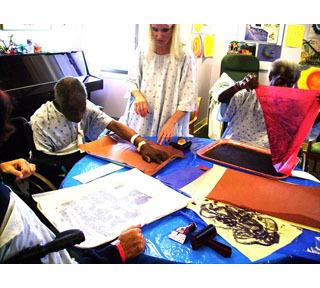 Despite people’s physical limitations, it almost always offers some relief, particularly because they have had a chance to physically feel the emotions come directly from their bodies onto the paper. Touch Drawing is truly a magical tool for so many things. The fact that it can be used as such an effective form of pain management, not to mention in so many therapeutic contexts too numerous to mention here, tells us that the exploration of the applications of Touch Drawing has only just begun. 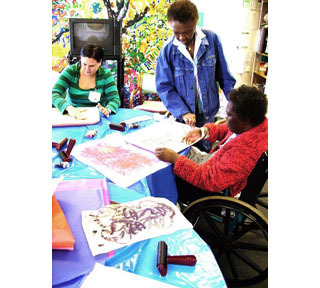 Rebecca A. Leonard holds an MA in Counseling Psychology with a concentration in Expressive Arts Therapy from the California Institute of Integral Studies, and is a licensed MFT in the state of California. 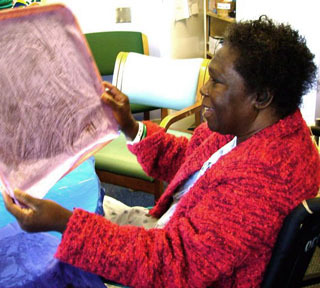 She has worked as an Expressive Arts Therapist in the Activities Therapy Department. at the California Pacific Medical Center for nearly five years. 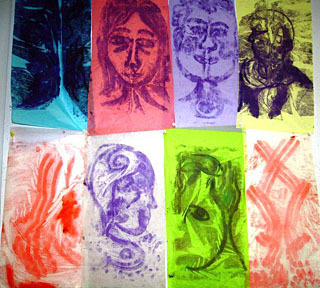 She also has a private practice where she uses Touch Drawing both in groups and with individuals. 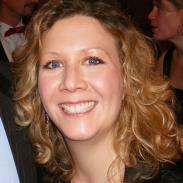 She has a page on the Touch Drawing Community and can also be contacted at RAL4MFT@aol.com. Rebecca has opened a Touch Drawing and Pain Management group http://touchdrawing.ning.com/group/touchdrawingandpainmanagement where you can connect with others and continue the discussion on this theme. Go there to continue this exploration with Rebecca and others.